I want to say it was my second year at Penn State which would be the fall of 1996. I still hadn’t discovered that whole industrial design thing which would eventually lead me to the Rhode Island School of Design’s I.D. Department. It’s funny how chance encounters can lead you in a new direction. But I had “reorganized” my pursuit of my education and had fully committed to Penn State’s School of Arts and Architecture. (I had originally declared my major in Biology…). It was a change in direction. I was feeling really inspired but a bit let down I had not gotten into the School of Architecture which I had applied to in my Freshman year. Actually, that was the best rejection notice that could have happened. Because it spurred an acceptance of who I was and what my natural talents were. That was the take away. Simply stated: I decided to pursue my passion. The visual arts. So part of that “reorganization” were requirements to take foundation type studies. One of them of course was 3D / Sculpture. I think it was technically listed as Sculpture 101. The teacher was Tom McGovern (sp?). He was a wiry guy with a big beard and when we’d have critiques he’d often host them outside and I think he was a chain smoker because as soon as we stepped outside, I didn’t even see the lighter strike. But I digress. Tom introduced me or rather formalized what I had really taken an interest in all along and that was working with my hands to solve problems with creativity in a three dimensional format. But these early classes weren’t about the finished product or piece. It was about your approach, methodology and process by which you navigated from point A to B visually. The “how” you solved a problem. One of my favorite first projects was Subtractive Sculpture. The project was simple: We poured plaster into a bucket using a release agent and then once dried, we were to carve the plaster “tub” into a new shape. The trick or rather the challenge is to create a form which is completely divergent of it’s original form. Bonus points if you could some how visually make ties to it’s origins, leaving traces of what it was without being too literal. I believe my pieces were these large intricate spiral like shapes. We had to mix the plaster in the form and a stirring motion of course was used, hence the spiral like forms. But it’s that level of restriction that alway intrigued me. How far can you push a shape away from it’s original before it’s transformed into something completely new? It’s that same approach I come at my chain stays. The raw material or rather raw shape is a simple straight tube. I’ve built specific tools to control the process of transformation that are functionally driven but inherently lean on the form as it takes on the new shape. Up above is the result of about 2 days of work. I had to translate how I make my mountain bike chain stays in steel for titanium. It’s similar in many ways to steel, but has it’s own set of characteristics that are specific to itself. So how to capitalize on that while still retaining some of that lineage? The above are the results. 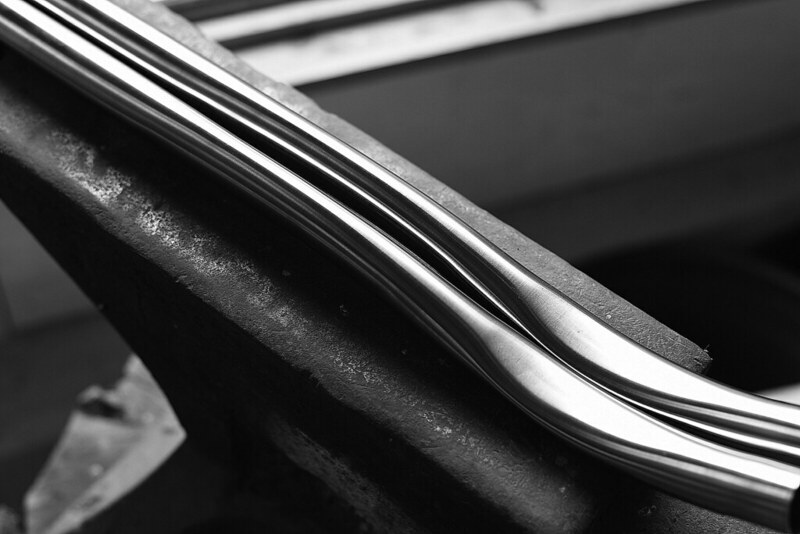 It’s just a tube to some but to me, it’s an incredibly exciting challenge to work within those tight restrictions in which I marry both form and function while transforming the material into an entirely new shape. I think of Tom and that bucket of plaster often when challenges like this come around.